So, I’ve looked at J. M. Spaight’s predictions in The Sky’s the Limit about how the British fighters would fare in the Battle of Britain, and how the German ones would too. All that remains is to examine his thoughts on the German bombers. There is no doubt that the Wellington is far more efficient as a fighting machine and capable of giving a much better account of itself against enemy fighters. Taken all round, the Wellington is the much better aeroplane, with greater range, defence and bomb-load achieved on less power, with only slightly less speed. This is a pretty fair judgement. The Wimpy’s defensive armament was superior, with 6 machine guns in power turrets and 2 in waist positions, to the Heinkel’s 5-7 manually-aimed machine guns. But neither was adequately armed for defence against fighters, which was the really important comparison. 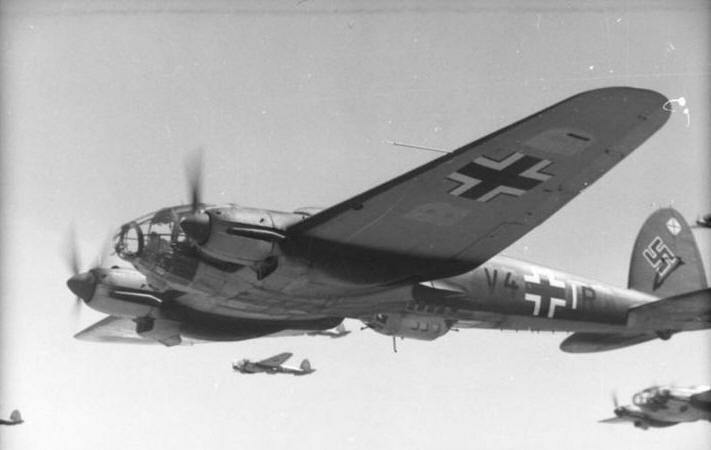 German “reconnaissance” bombers mentioned by Spaight include the very robust Do 17 (the famous Dornier “flying pencil”) and the Do 215 (actually an export variant of the Do 17, which actually didn’t see much service with the Luftwaffe). Again, he compares them with their nearest British equivalent, in this case the Blenheim IV. Again, this is not a particularly useful comparison. The Blenheim may have been ‘undoubtedly a much more unpleasant machine to meet than the Do 215?, but this situation was unlikely to arise for British fighters. 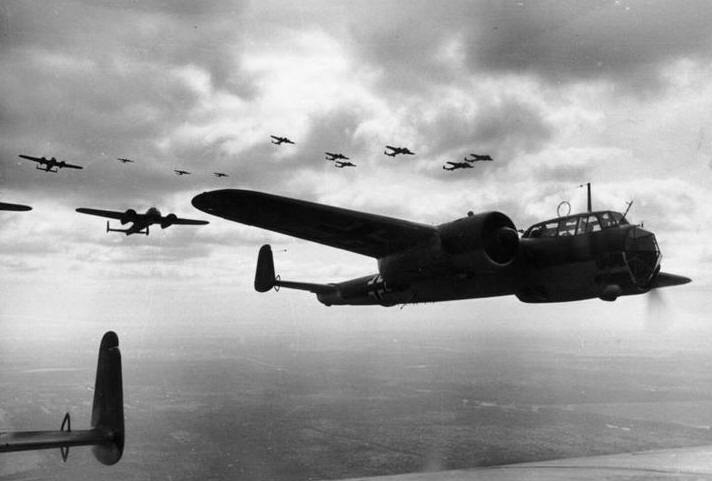 Recently the Germans have been making increasing use, especially for raids against shipping, of Junkers Ju 88 bombers … At 300 miles an hour its range is over 1,200 miles, and with full military load its speed is understood to be 265 miles an hour and its range about 1,300 miles. ‘[E]vidently a formidable machine’, he goes on to say, `but [it] would be completely outclassed, for speed, by our Spitfire’. So at last, Spaight is properly comparing apples with oranges — and reassuringly, the RAF comes up trumps once more. “Evidently a formidable machine” yet, reassuringly, no match for the Spitfire. The experience of Bomber Command in late 1939 backed this up, when Wellingtons attacking German naval bases were severely mauled by defending fighters. Spaight speculated that in future, fighters might tend towards the larger, twin-engined types (like the Me 110 or Fw 187), so that they could carry more armour, heavier guns and more ammunition. 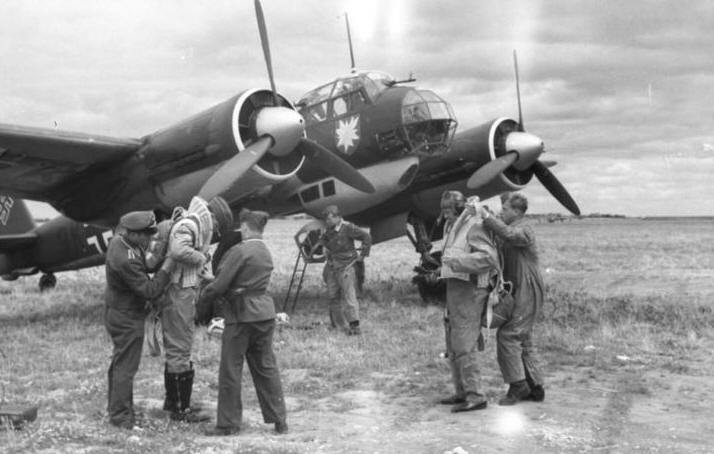 Conversely, bombers might well become smaller, as heavy bombers appeared too slow and vulnerable to fighters. This didn’t happen, but there was some convergence in the form of fighter-bombers like the Typhoon. Heavies remained in use (and only got heavier), but their vulnerability to fighters was addressed by attacking at night or providing fighter escorts with drop tanks. So, to sum up finally, what can we say from all of this? That the future is uncertain is a given; that the present is also is perhaps less easy to appreciate. Spaight was wrong on many points, but he generally had reasonable grounds for being so. However, one suspects that the way that British aircraft always turn out to be superior to their German opponents was not necessarily grounded in sober analysis, but rather in a desire to prop up morale. After all, this book as aimed at a popular audience, and was updated and reprinted at a time when it appeared that Britain’s future depended upon air defence. It’s hardly surprising, therefore, if Spaight decided to forego his usual judicious sifting of the evidence and told his readers what he thought they needed to hear. The pre-war fear of the bomber was a liability in 1940. Only in 1944, when the Combined Bomber Offensive was pounding targets in Axis-controlled Europe around the clock, did Spaight find it expedient to reverse his position once more in his apologia Bombing Vindicated.